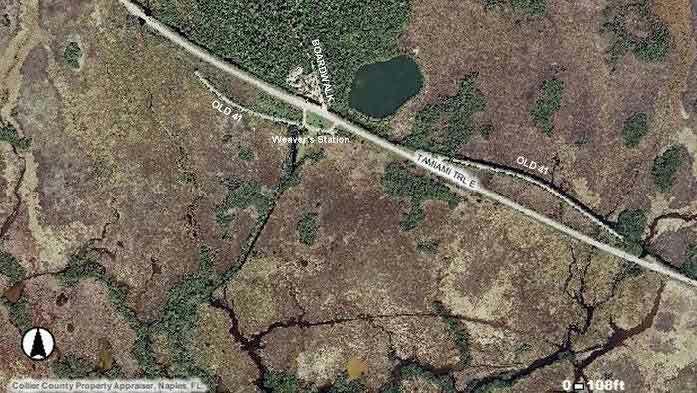 Aerial photo from the Collier Appraiser’s website with old US41 and the existing Boardwalk on the north side of the Tamiami Trail. It is with great pleasure to report that our BoardWalk Vision is starting to move forward. The Park Service has almost completed their plans of the parking area, restrooms, and picnic pavilion at the new entrance off the abandoned US41 site. Also included will be a deceleration lane to move traffic safely on and off the highway. These improvements will be funded by the Park Service! The BoardWalk Vision committee sent out Requests for Proposals to begin the first phase of the Interpretative Master Plan for the route of the new pathways; design of exhibits and graphics that will connect the new entrance with the existing boardwalk. The Vision committee evaluated four proposals, interviewed the principals of the two final contenders, then checked references. The committee unanimously selected The Acorn Group to begin the design. Meetings are scheduled to start in January with the completed report due at the end of June 2015. These plans will include a bridge across the canal and the final design of a “cracker style” Visitors pavilion with pathways and boardwalk around Green Heron Lake to connect with the old boardwalk. Exhibits and graphics will be designed along the trails for Visitors to enjoy the beauty of the Fakahatchee rather that keeping folks inside a building. Special emphasis will be on exhibits to engage children of all ages to learn about the wonders of nature – to lure them away from their electronic devices. Parks reserves that had been set aside by the FOF. These contracts will allow the Friends to finalize the required planning and permitting to prepare to raise the funds necessary to complete the Vision.